Click image to enlarge Sunset on the "Cable Bridge", Kennewick, Washington. 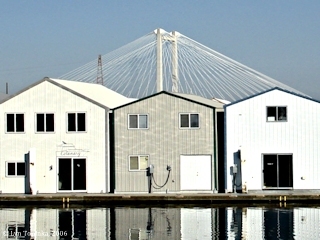 Clover Island is on the right. Image taken September 24, 2005. The Pasco-Kennewick "Cable Bridge" spans the Columbia River between Pasco and Kennewick at Columbia River Mile (RM) 328.5. The bridge opened in September 1978 as a replacement for an existing "Intercity Bridge" which was built in 1922 (see "The Golden Age of Postcards" below). Upstream of the bridge is Clover Island and the Pasco-Kennewick "Blue" Bridge. Downstream is an old railroad bridge, still in use. Three miles downstream is Washington's Sacajawea State Park which offers a view of both bridges. 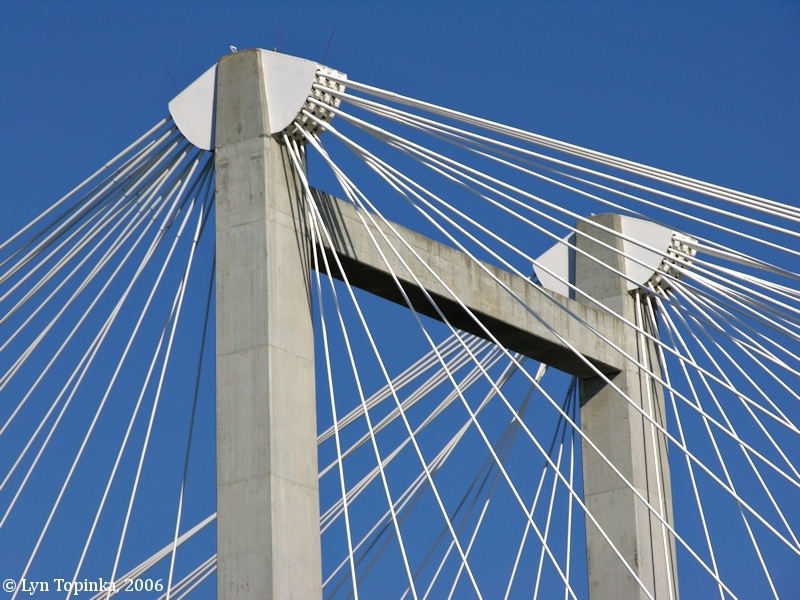 The "Cable Bridge" is officially known as the Ed Hendler Memorial Bridge, named after a former mayor of Pasco, who helped promote the construction of the bridge. The Pasco-Kennewick "Cable Bridge" opened in September 1978 as a replacement for an existing "Intercity Bridge" built in 1922 (see "The Golden Age of Postcards" below). 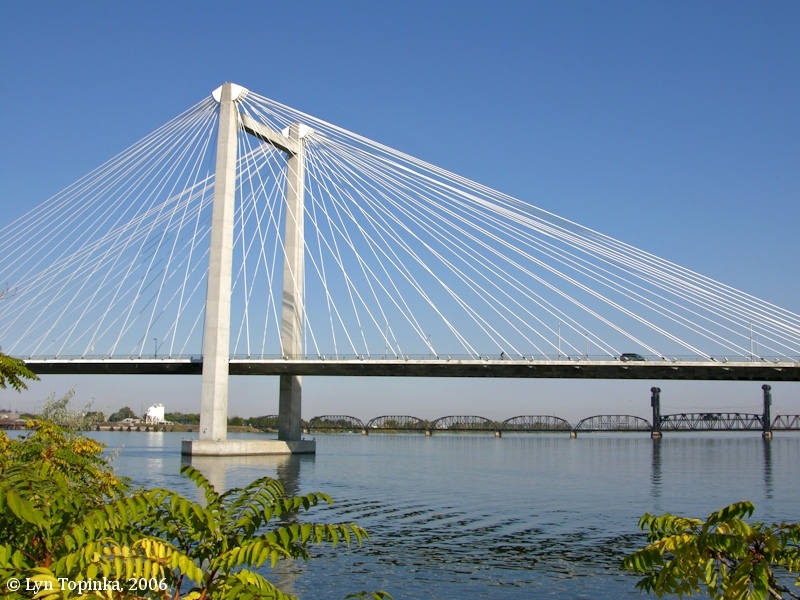 This new "Cable Bridge" is 2,503 feet with a center span of 752 feet. 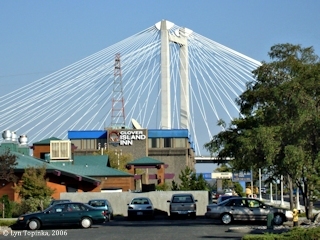 At the time of construction it was the longest cable-stayed bridge in the United States. 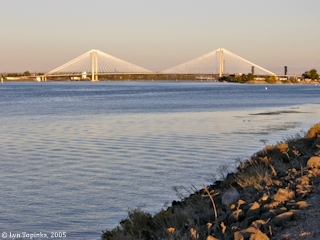 Today many bridges in the U.S. surpass this length, with the longest being Florida's Dames Point Bridge with a center span of 1,295 feet, built in 1989. The world record is held by Japan's Tatara Ohashi Bridge linking Honshu and Shikoku Islands, which has a center span of 2,919 feet. In 2003 China began construction for an even longer bridge, the Sutong Highway Bridge over the Yangtze River, a cable-stayed bridge with a main span of 3,570 feet, and is expected to be open for traffic in 2008. 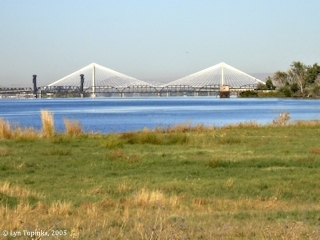 Click image to enlarge Pasco-Kennewick "Cable Bridge", as seen from Sacajawea State Park. In the foreground is an old railroad bridge, still in use. Image taken September 25, 2005. Click image to enlarge Cables, "Cable Bridge", Kennewick, Washington. The old railroad bridge crossing the Columbia can be seen in the background. Image taken September 24, 2005. 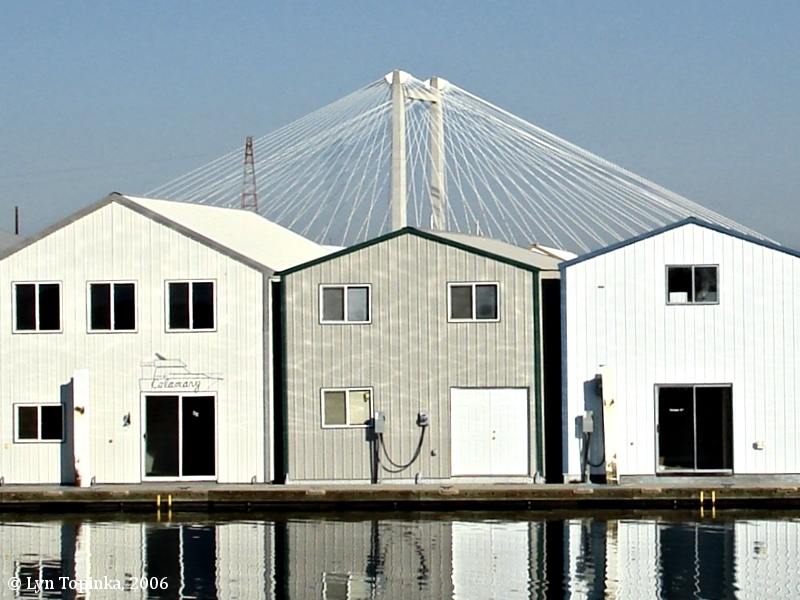 Click image to enlarge Dock houses and "Cable Bridge", Clover Island. Image taken September 29, 2006. Click image to enlarge Penny Postcard: "Intercity Bridge" crossing the Columbia River between Pasco and Kennewick, Washington, ca.1930. Penny Postcard, Postmarked 1930, "Columbia River Bridge between Pasco and Kennewick, Wash." This bridge was constructed in 1922. It was replaced by a cable-suspension bridge in 1978. Published by J.L. Robbins Co., Spokane, Washington. Card #1855. Card is postmarked September 2, 1930. In the private collection of Lyn Topinka. Click image to enlarge Penny Postcard: Columbia River from the Pasco-Kennewick Bridge, ca.1940s. Penny Postcard, ca.1940s, "Columbia River From Pasco-Kennewick Bridge." Ellis Photo #2866. In the private collection of Lyn Topinka.